“Africa” presidential suites are located on the 6th floor. They have an area of 110 m². 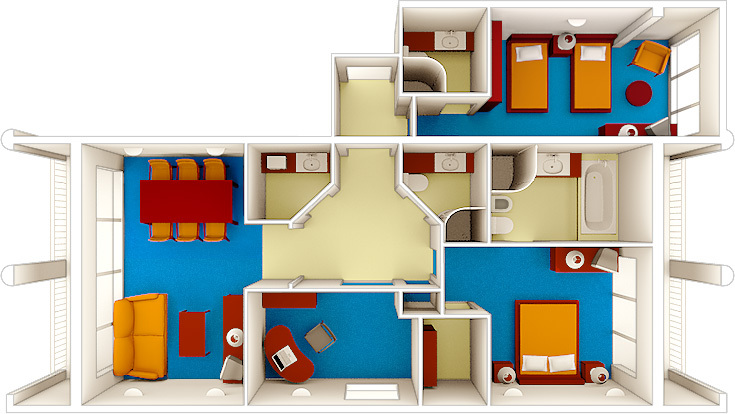 “Africa” presidential suites consist of a bedroom with separate entrance and bathroom, living-dining room, main bedroom and study, and have kitchen equipment, including a microwave oven, and balcony with set of summer furniture. The master bedroom has a king size double bed, and in the living room – sofa, and the second bedroom has two single beds. “Africa” presidential suites have round-the-clock room service available for food and drinks. Guests living in apartments take their meals in the VIP-lounge of the Panorama Restaurant.